House, 7 Bedrooms, (Sleeps 18-22) Off Season 4 Day weekend rate. Welcome . . This is our home and not a business. We travel extensively and rent a few of the weeks during our travel dates. This varies from year to year. Some years we have donated to such groups as Life Net and a few Christian Youth Groups. Our property is perhaps the ultimate for family reunions. Spacious and private with so much to offer your family. Reunions are very special here. We are located on the end of a private peninsula. Faces west for great sunsets. You'll love our private harbor for your swimming enjoyment. Our private boat ramp is here on our property. Boat Ramp with docks for several boats. Local Catering available with tents for weddings. You may bring boats, Jet skiis, Canoes, sailboats and launch them at our own private deep water concrete boat ramp on the South side of the property. 90% of the house has covered AND carpeted decks. Camp Fire area by the water, Gazebos, Pavilions and lots of places to sit and relax. * There are SEVEN queen-size beds and TWO double bed which will accommodate 18 persons in beds. * Several bedrooms have space for children on air mattresses. * Handicapped ramps from driveway to main floor. * The four bedrooms on the main floor have master bathrooms, skylights, overhead fans, and a view of the water. * Three of these bedrooms have glass sliding doors that open to the outside covered deck that wraps around the house. * Great room (21x32) has three full couches, piano, 3 sliding glass doors, six windows, stereo, games, puzzles and a lake view from anywhere in the room. Seating for 16 people in comfy chairs and couches PLUS a game area with another 16 people. All in the same area with great views of Lake Anna. * House has 12ft wide deck that wraps around three sides of house. There is a Deck on top of house where you can tan in private or just enjoy the view. At night, check out the shooting stars from this deck. ALL ARE CARPETED AND COVERED FROM SUN AND RAIN ! * Three rooms are carpeted and sleep eight persons. * One full and three queen size beds. * There are two bathrooms on this level. which is independent from the other two systems in the house. SWIMMING - FISHING - BOATING - BOAT RAMP - KOI POND - MUCH MORE! * Fishing is great right off the dock. We catch large mouth bass, striped bass, catfish, carp, bluegills, and an occasional stickfish and of course great whites. * There are fishing guides on the lake that will,(for a price)show you how, when and where to catch fish on the lake. * Docks on the west side extend out and join together with a 20x20 foot gazebo over the water. Together they form your own private harbor. The gazebo is illuminated for night use. * Bring your boat and launch at our own concrete DEEP WATER boat ramp. You may rent boats at a number of local marinas. * Enjoy the KOI pond waterfall in a swaying hammock in the shade located on the south side. 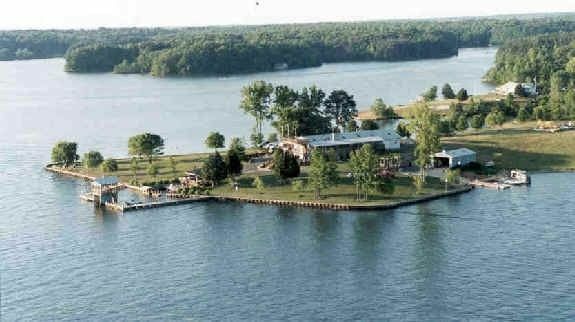 EMERY POINT is on the state map of Lake Anna. Located at the south end of the 17 mile long Lake Anna, one mile from the Dam in Spotsylvania County. * 70 minutes from Charlottesville. 90 minutes from Washington. * KINGS DOMINION, is just 18 miles southeast of the Point. * LAKE ANNA WINERY is nine miles away. * HISTORIC SITES - The city of Fredericksburg is full of history. * SPOTSYLVANIA/MASSAPONAX - Some of the greatest battlefields of the Civil War are within 45 minutes. Keywords: Large house, Lake Front, Weddings, Estate House on 2000' Waterftont, private. Please know this . . . All reviews are 100% real and written by our guests . . not like some who write themselves a couple of good reviews and fool you. We have over 50 ACCURATE reviews. We built our house with entertaining and our own family reunions in mind. Designing the decks with shelter from the sun and rain allows your family to enjoy outside deck activity no matter what the weather. We built a seawall around to protect the property fro storms. Then added a Gazebo, docks, and boat ramp to maximize a second to none waterfront view. We are located at the South end of Lake Anna where there's less boat traffic, deeper, cleaner water, fantastic views and terrific sunsets. It is a very peaceful property but still allows families to take full advantage of all water activities. For protected swimming we built a sheltered harbor so we could swim without worries of boats passing by too close. This property is truly a piece of Heaven on Earth. There's so much to do on our property that it's hard to describe it all. So many places to sit and relax, so many areas to have fun. Did we mention our deck on the roof to star gaze with an unobstructed view? You can bring one or several boats, sailboats, personal watercraft , pontoon boat or rent one from a local marina. One comment we often hear is that parents can spend quality time with their children here. So much to do together without the distraction of boardwalks etc as in Ocean Beach Rentals. Here you get to enjoy all the boating, swimming, jumping off the Gazebo, use the kayaks, canoe, playing games both inside and out, rest in a hammock under a tree. Watch the shooting stars from our roof deck. We can play board games with your kids or grandkids. And then there is the fishing off the docks. You can all be together or have your space in one of the many sitting areas like the Koi Pond. Sit and listen to the waterfall, watch the fish and relax. Please go to our web site listed below to see photos of our white sand beach next to our harbor and swimming area. You can see beutiful Lake Anna from every window on the first floor. House is located on Emery Point with 2,500 ft of waterfront. Three separate large A/C systems with all independent thermostats. Three separate heating systems. Independent thermostats. Paved parking for 15 cars. Grass parking for 30 cars and boat trailers. Our GREAT room is 28ft by 22ft with four doors with views of Lake Anna through all doors. Piano, wide screen TV. All doors open to a covered and carpeted deck. Three refrigerators with freezers. Also a large chest type freezer. Two five burner gas stoves installed 2015. Two large coffee pots and a K cup maker that works with all K Cups. Just about anything you can possibly need iin duplicates. Dishes, silverware and all relative needs enmough for 30+ people. Inside dining room seats 18. Dining table on the covered deck seats 22. Wide screen TV with Direct TV service. Several HDMI inputs. Dozens of games to choose from. Covered and carpeted decks on three sides of house. No worries about hot sun, rain or nasty weather. Bright Full Kitchen, Most appliances are duplicated, 2 toasters, 2 crock pots, 2 waffle irons etc, 2 stoves, 2 ovens, + A/C, M/W, D/W, W&D, 3 Refrigerators, one is a new 29 cubic ft and the other is a 26 cubic ft, Separate from the two refrigerators is a large chest type deep freeze, wide screen TV with Direct TV Satelite service, 2 Gas BBQ Grills, dining table inside seats 18, outside dining table on sheltered deck seats 22 persons with lights for night dining, Please, Remember there is no smoking anywhere in this house. Our large house is located on the end of a long penninsula, Facing west for great sunsets and soft breezes, Outside activities, Vollyball courts with shade trees nearby, Two sets of Horseshoe pits with shade trees at both ends, Campfire area with benches, Basketball hoop on paved area, Large covered beach deck overlooking white sand beach and shallow water kiddie area, boating or sit in a hammock and snooze, Several quiet picnic tables for sitting / reading / games / playing cards or putting together one of our twenty various puzzles, Please feel to bring any boats you may have and launch them at our own boat launch, Playground with swings, elevated clubhouse, tube slides and shaded area over a picnic table.